How Can Hong Kong Use Its Natural Resources? What are our natural resources really worth? Watch live now. The idea of maximising benefits provided by nature is not new to Hong Kong. Towards the last part of the 20th century, most of Hong Kong’s population and industry still depended on the local ecosystem for food and resources. In the 1970s, the government used natural systems (alongside mechanical engineering) to conserve water sources and to protect settlements from landslides through extensive reforestation schemes. The secondary effect of such schemes led to the formation of Hong Kong’s country parks to protect these “new” forests, which has led to these areas being mostly undisturbed to the present day. Currently, about 40% of Hong Kong’s land is country park or nature reserve. Today, the Hong Kong Government is trying to address new environmental challenges through a series of action plans. The “Biodiversity Strategy and Action Plan” (BSAP, published December 2016) and “Climate Action Plan 2030+” (CAP30+, published January 2017)2 detail these environmental concerns and indicate links with sustainable growth and development. 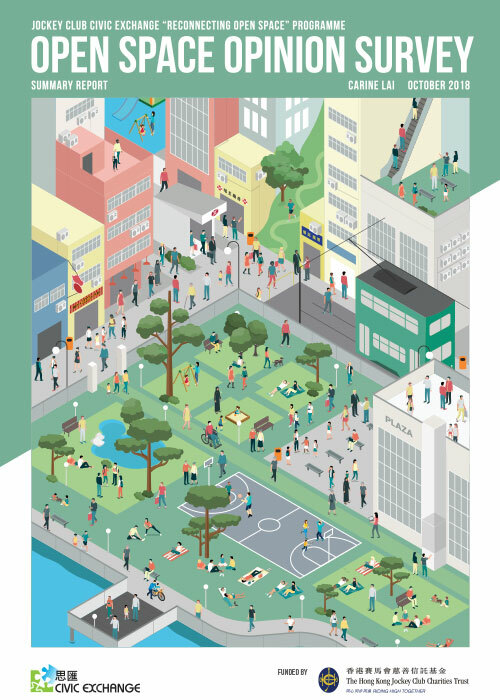 The “Hong Kong 2030+”3 development vision also addresses sustainable, green and environmentally regenerated aspirations for our city. 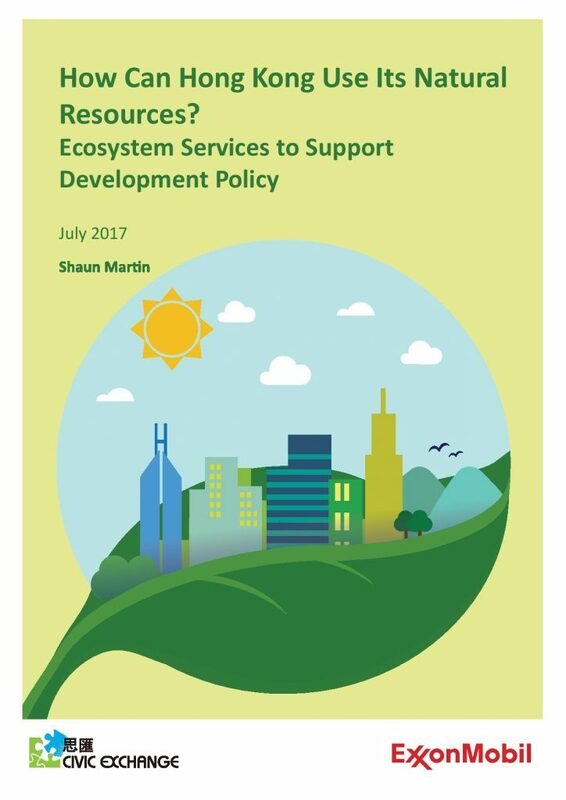 This paper will introduce the concept of “Ecosystem Services” (ES), a term mentioned in the BSAP and CAP 30+, and explore potential new ways for the Hong Kong Government to consider the value of our natural resources and its use. The hope is that this briefing paper will be the first step in greater study in this field, especially as a new Chief Executive and administration take office on 1 July 2017. “Ecosystem Services” is the term used to describe what biodiversity and natural environments do rather than what they are. A Civic Exchange study from 2002 highlighted both the “direct and indirect use” values of natural services in Hong Kong and estimated the “quantifiable conservation value” of our natural resources to be from HK $1.8 billion to HK $6.5 billion (US $230 million to US$883 million) annually.4 Given advances in knowledge and assessment since 2002, the value of these services could become a more integral part of our infrastructure planning, whilst still maintaining our highly competitive economy. As our needs, climate and available resources change, so must our policy making responses. At the same time, certain issues, such as water and air pollution, have persisted far longer than they should have. Although technological and regulatory changes have brought improvement, there is a continuing need for new, more effective tools to eliminate these and other problems. There are potential barriers to such innovation, such as a lack of public interest or political action. In 2017, a Civic Exchange study surveyed public understanding of biodiversity, parallel to the government’s BSAP public consultation process.5 It found that 75% of respondents in Hong Kong did not fully understand what the term “biodiversity” meant. This makes it difficult to say whether the public cares about the issue, at a time when there are controversial proposals around natural resources – for example, to develop areas near country parks. In another example, Civic Exchange released a 2017 report called ‘The Illusion of Plenty’ regarding a water scarcity problem that the wider public may not know about. The report pointed to wastage, both by the Government and domestic users, of a natural resource whose true value has not been ascertained. As the Hong Kong Government spends more than HK $4 billion (more than US $500 million) a year importing fresh water from Guangdong, more attention needs to be paid to whether this “ecosystem service,” our own local water supply, is being best used and conserved. The same risk applies to “green infrastructure” solutions included in development plans; if the public cannot understand or compare them to man-made alternatives, how can they make informed decisions? If the Hong Kong Government can identify and articulate how environmental features form a part of development plans, the public and all relevant stakeholders will be able to understand the extent to which those plans meet both growth and conservation goals. If we create a culture in which nature acts as a functional infrastructure component, we can start to compare this to market solutions in providing the same services. Once we understand what nature contributes to development, its inherent value can help to end the misperception of development and conservation as being inherently opposed. Hopefully, it can lead to a better coexistence of environmental concerns and economic development. This document aims to explain how we might advance along that path, and what we might hope to gain from doing so.